As we move into hurricane season, the American Academy of Family Physicians has released disaster preparedness resources for both practice and personal needs. I’m always amazed by the practices I visit that don’t have an EHR downtime strategy or business continuity plan. Even if they have plans, it’s rare that they have done drills or really discussed what would happen in a serious emergency. I’m not a serious doomsday prepper, but I do have some survival basics in my car including water, food, a first aid kit, and a survival blanket. There are plenty of organizations that end up having staff sleep at the hospital or medical office buildings in the event of major disasters, so it’s not a bad idea to keep some extra clothing and essentials like a toothbrush in your “go bag” because you never know where an emergency is going to happen. Backup solution vendor Webair is offering complimentary offsite backups and disaster recovery services for business affected by Hurricane Florence. Clients can select backup replication sites on the West Coast or outside the continental US. I took a look at their offerings and was happy to see that they include up to 72 hours per month for disaster recovery testing. Far too few sites test their backups or disaster recovery strategy, so this is a plus. HHS has declared a public health emergency in the Carolinas in preparation for Hurricane Florence. The public health emergency eases some restrictions for Medicare and Medicaid providers, and likely will lead to accommodations for various reporting requirements for 2018. I know all of us hope that the storm will not be as bad as predicted and are sending our prayers to the East Coast. CMS is convening a Technical Expert Panel to look at the Merit-based Incentive Payment System, specifically the Improvement Activities (IA). This panel will give feedback and provide “direction and thoughtful input on the improvement activities during development and maintenance.” They’re looking for a dozen clinicians with expertise in the Improvement Areas, consumer/patient/family caregiving, healthcare disparities, performance measurement, and quality improvement. Nominations close at 5pm PT on September 22. A wise man once told me to always spend a little time looking for my next career move, so I keep my eye out for interesting postings or opportunities. On Tuesday, I received a notice from ONC that they were looking for a medical professional in the Clinical Division. I have no desire to relocate to Washington, DC but was curious about the posting. Clicking the link embedded in the email took me to Indeed.com, where the header said the posting was no longer available on Indeed. It’s going to be difficult to recruit someone if you don’t keep the posting live, and the email from ONC made it sound like it would be open through September 19. It did cross-link me to a Medical Officer posting, which was interesting in that it was targeted to someone who is already employed by a governmental or academic institution that is willing to contract them out for a period of two years. Despite the requirement that the candidates be MD or DO physicians, the salary range is $114k to $164k, and there is no eligibility for federal benefits. I wonder if they will have candidates beating down the doors for this one given the cost of living in the DC area and the earnings potential for physicians in clinical practice. It’s that time of year to start talking about flu season preparedness. 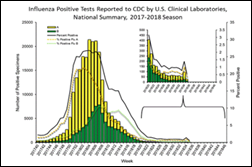 This week brought a blip in reported flu cases, and I hope it’s not a predictor of an early or more severe flu season. Vaccinations arrived at my clinical office on Tuesday, and everyone rolled up their sleeves and got it done. After seeing the number of seriously ill patients we saw last season, no one wants to experience that personally. Please consider a flu vaccination to protect patients, your family, and the community. LOINC is holding its annual Fall Conference next month in Salt Lake City. Workshop topics include Document Ontology, the use of the RELMA mapping assistant, Clinician Perspective, and FHIR. I’ve been doing LOINC mapping for clients for nearly a decade and appreciate the logic and deliberate construction of the framework. Sometimes the specificity of some of the tests seems complicated to those who haven’t worked in the depths, but when you’re looking for granularity with lab data it’s important to be as accurate as possible. The Pew Charitable Trusts, the AMA, and MedStar Health have released a new report detailing recommendations for improving EHR usability and safety throughout the software life cycle. It also identifies what can be considered rigorous strategy testing and how to create testing scenarios based on currently-understood EHR safety issues. The report also addresses the culture of safety along with EHR user training as ways to improve patient safety. Other topics covered include EHR design and development, EHR implementation, configuration and customization by end users, and EHR upgrades. This is National Suicide Prevention Week and gives us the opportunity to reflect on the lives lost each year due to suicide. I think often of my medical school classmate, the high-school student I taught, and a family member we lost to suicide. Our local high school’s Harvard-bound valedictorian went missing after graduation and committed suicide. It really is everywhere, and it can be prevented. TMF Quality Innovation Network is hosting a webinar titled “Suicide Prevention Tips for Physicians, Clinical Staff and Their Patients,” to be held September 18 at noon CT. It features Christine Moutier, MD, CMO of the American Foundation for Suicide Prevention, along with Leah Patterson, a survivor. They will offer practical tips for clinicians to address suicide risk for patients, peers, and themselves.